Commander of the People’s Armed Police. 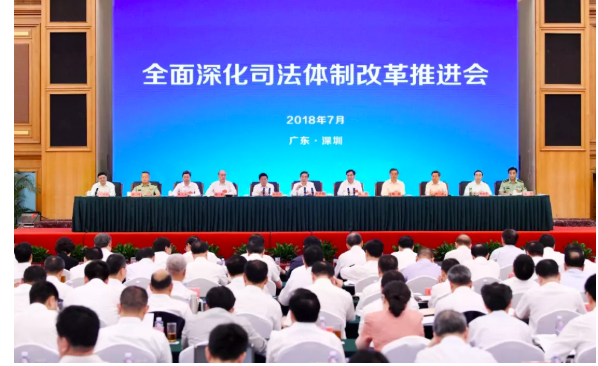 Attendees of the conference included the Party Secretaries of the Political Legal Committees of all provinces/autonomous regions/cities, and likely senior leaders from all of the systems. Readers of this blog will not be surprised that comprehensive deepening of judicial reform was the subject of the conference as a December, 2017, blogpost flagged that the new phraseology is “deepen the reform of the judicial system with comprehensive integrated reforms” (深化司法体制改革综合配套改革) (and there is a significant overlap with some of the issues Judge Jiang mentioned). The language is found deep in Xi Jinping’s 19th Communist Party Congress Report. The quick (and incomplete) summary below is of some of the court-related issues from the report of Guo’s speech at the conference that He Fan (head of the planning section of the SPC’s judicial reform office) posted on his Wechat public account. He was one of the many attendees. None of the analysis below (in italics) should be attributed to him. It can be expected that the court-related issues will be incorporated into the next judicial reform plan outline. What is on the court-related reform list? What issues remain unresolved? Strengthen and optimize Communist Party leadership, Scientifically position the responsibilities and boundaries of the Party Committee, Political and Legal Committee, strengthen functions such as overall coordination, planning and deployment, supervision and implementation. This of course listed first.What does this mean in practice for judicial system and particularly the operation of the criminal justice system, such as the ongoing campaign against organized crime (see this earlier blogpost)? Clarify the functions of the four-level courts,–improve the SPC circuit courts’ working mechanism; establish the Shanghai Financial Court, steadily expand the Internet Court pilots; explore the deepening of the reform of cross-administrative district courts and procuratorates, and explore the establishment of a national-level intellectual property appeal hearing mechanism. Developments have occurred on some of these. The Shanghai Circuit Court will start operations soon, with regulations on its jurisdiction just issued and well-regarded judges appointed to senior positions. The mention of an intellectual property appeals court is significant, as that has been mentioned in earlier government documents and it is on the wish list of the intellectual property law community. The cross-administrative district courts are mentioned in the previous court reform plan, with some pilot projects. On SPC’s circuit courts are taking on a greater percentage of the SPC’s cases, (as mentioned earlier on this blog) SPC judges work in the circuit courts while their families remain in Beijing, so at some personal cost to judges involved. 3. Improve institutional management, promote a combination of flat management and professionalization, adhere to the simultaneous transformation of comprehensive and operational entities, and promote the return of judicial personnel to the front line. As this blog has repeatedly mentioned (and He Xin/Kwai Hang Ng have detailed in their new book, Embedded Courts), Chinese courts (as courts and political/legal institutions) have large “comprehensive offices” (engaging in functions not directly related to judicial work). A recent study of several courts in Zhejiang province published in an academic journal affiliated with the China Institute of Applied Jurisprudence detailed the percentages. With the reduction in the number of judges and the explosion in the number of cases, there is a great amount of pressure to allocate more judges to the “front line” of handling cases. Judges with some measure of seniority inevitably have both administrative and judicial responsibilities. 4. Improve the supervision management mechanism of the president and division chiefs, and standardize the functions of the judicial committee, the committee of court leaders, which has a number of functions, often serving to diffuse responsibility for difficult cases (Embedded Courts has more insights on this, and this blog has an earlier post on proposed reforms and related problems). Improve the professional judges meeting (mentioned in last year’s SPC regulations, I hope to have something more to say on this in a later blogpost). Improve the disciplinary mechanism of judges. (It would be an improvement to have greater transparency on the results.) Accelerate the construction of an electronic file with the simultaneous generation of the case and the entire process online case handling system. This has been an ongoing proposal. Shenzhen is taking the lead with this. Also it would be an improvement to have greater transparency on cases filed. 6. On judicial “standardization” –improve reference to similar cases, case guidelines, the guiding case mechanisms, implement mandatory search system for similar cases and related cases. We will carry out an in-depth national judicial standardization inspections. This is sending two signals–greater implementation of China’s case law system (as I have written about earlier), and the continued use of government/Party inspection campaigns (reflecting the administrative aspects of the Chinese courts). 7. Improve the performance appraisal system. Scientifically set the performance appraisal indicator system for handling cases, and guide judicial personnel to handle more cases, handle cases quickly, and handle cases well. Use big data technology to accurately measure the quality of the case and strive for convincing results. The assessment results are used as an important basis for the level of salary, job promotion…This is an important and unresolved issue for the Chinese courts–how to appraise judges. Outside of China, many scholars have written about this, including Carl Minzner, William Hurst & Jonathan Kinkel. A good deal of research has been done within the Chinese court system concerning this (see this summary of a report published earlier this year by a team of Guangdong Higher People’s Court judges–discussing how the “civil servant/administrative model” predominates and suggesting that China should be looking to other jurisdictions for models, as judicial evaluation is a worldwide issue. Case closing percentages continues to be very important for Chinese judges. Is big data technology the answer? Is this consistent with encouraging judges to write more reasoned decisions? This appears to signal a continuation of the judge as factory worker system described in this blogpost. 8. In the area of criminal law, and criminal procedure, there are mixed developments. On the one hand, greater encouragement for using the plea bargaining with Chinese characteristics (please see Jeremy Daum’s deep dive into the pilots). The merging of the arrest and prosecution stages is also mentioned. Guo also mentioned measures to enable appointing defense counsel in death penalty cases, having full coverage of defense counsel in criminal cases (Jeremy Daum has comments also on the system of stationing lawyers in detention houses), requiring lawyers to represent petitioners in criminal collateral appeals cases, as well as greater use of live witnesses at trial。 The National Judges College academic journal Journal of Law Application just published an article by a Beijing Higher Court judge, reviewing the duty lawyer scheme, with analogous findings to Jeremy’s. 9. For those interested in how the supervision commission is/will affect criminal cases, Guo mentions establishing a system for linking the supervision’s investigatory system with the criminal procedure system (said to improve the battle against corruption, the question is the extent to which individual rights are protected). 10. On foreign related matters, Guo mentions innovating foreign-related work, and improving cooperation on international enforcement and judicial cooperation. These continue to be difficult issues, with no likely resolution in sight, particularly criminal and also civil. As I have mentioned before China is participating in the drafting of the Hague Convention on the Recognition and Enforcement of Foreign Judgment, but there are major inconsistencies between the provisions of the draft convention, and the Choice of Court Convention which China signed last September. Guo highlights improving an initial appointment system for judges and procurators, expanding open recruitment so that talented people will be attracted to becoming and remain judges. He calls for better coordination between the law schools and professional training, systems for provincial level appointment of judges (and procurators), with better policies on temporary appointment (挂职) (a system used for academics to work in the system for a period of one or two years, and judges/procurators from higher levels to work at the basic level or in a poorer area), exchanges, promotions, and resignation. In his recommendations, Guo tips his hat to judicial (and procurator) dissatisfaction with status and pay with his statement “uphold resolving a combination of ideological and practical issues, motivate cadres and police to the greatest extent possible.” 坚持解决思想问题和解决实际问题相结合，最大限度调动政法干警积极性”-as this blog has reported, a combination of those issues, excessive work, and significant amounts of time allocated to “studying documents” has led younger experienced judges (and procurators) to decide to resign. This entry was posted in alternative dispute resolution, bankruptcy law, big data, Case law, Communist Party and the Courts, court reforms and tagged Judicial Reform, shenzhen.